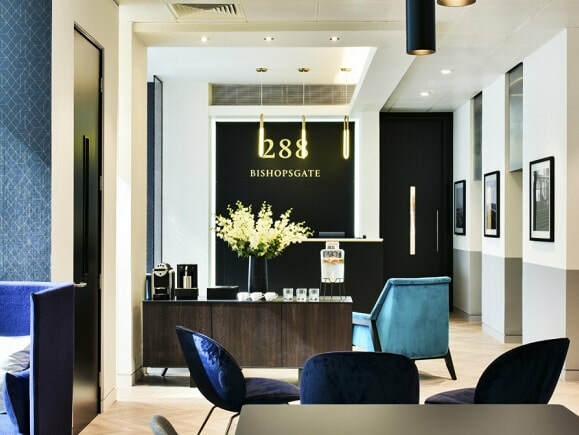 Close to Spitalfields market in EC2, this Business Centre is a superb modern glass fronted building located in the City close to Liverpool Street tube station which enjoys good rail links to the capital. The interior is of very high quality boasting an impressive reception area with marble flooring. With meeting and board rooms on-site, these serviced offices are arranged over 6 floors and include office furniture within the rent price. You will be also pleased to know that the building has twenty-four hour access and is unbranded throughout. The office rental also has disabled access and the building is fully air-conditioned.